A manifestation of his love of the theatre, Jeff serves on the Board of Directors for The Carnegie in Covington. Jeff Rosenstiel was a bookish kid, probably somewhat of an introvert. Theater helped him come out of his shell. He was the youngest of four by a mile – 18 years younger than his oldest sister who was often mistaken for his mother. His next closest sibling was 11 years older, so he was essentially raised as an only child. Jeff grew up in Florence, Kentucky, across the street from Kenny Price, the late country singer known as the “Round Mound of Sound.” He has fond childhood memories of the singer bouncing him on his knee, singing one of his hits that released in 1971, “The Sheriff of Boone County.” By age 6, he was already fascinated by live performances. At Boone County High School and later at Kentucky State University, Jeff became involved in theater. For eight years, he was involved in every single production. After college, he continued on with the St. Catherine Players, where he appeared onstage as Buckley Dunstan in “Father of the Bride,” Stewpot in “South Pacific,” and Slim in “Oklahoma.” He feels like theater helped him overcome a fear of public speaking. Following law school, Jeff became an adjunct professor of law at his alma mater, Chase College of Law, in addition to working full time as a litigator. He taught practical courses for 12 years such as legal research, writing, advanced appellate advocacy and trial advocacy. He tells a sweet, simple story about meeting his wife, Carolyn. “We were both invited to a group outing for a performance of Shakespeare at Devou Park, not knowing we’d been set up on a blind date. She had been outside swimming all day with her hair thrown in a ponytail. She knocked my socks off and still does. I’m generally not an impulsive person, but I proposed exactly four months to the day of our first date.” They have been married 26 years. They have two adult sons and a teenage daughter. Jeff enjoys spending time with his family and supporting the arts, often simultaneously. Now he enjoys attending their plays and his daughter’s recitals at the Cincinnati Ballet Otto M. Budig Academy and when she performs in the Nutcracker. Jeff also serves on the board at The Carnegie in Covington. Jeff is a partner in the firm’s Litigation Group, licensed to practice in the state and federal courts throughout Kentucky and Ohio. With over twenty years of trial and arbitration experience, Jeff counsels business clients on how to cost-effectively resolve their commercial disputes, as well as how to avoid new ones. As a determined problem solver, Jeff serves as outside general counsel for a number of area businesses. He also works with a number of national title insurance companies to resolve real estate issues. Jeff is active with the Northern Kentucky Chamber of Commerce – currently serving on its Executive Committee, chairing the Leadership Advisory Council, and serving as a member of the Eggs 'N Issues Planning Committee. Jeff is also active with the St. Elizabeth Foundation and Covington Business Council. 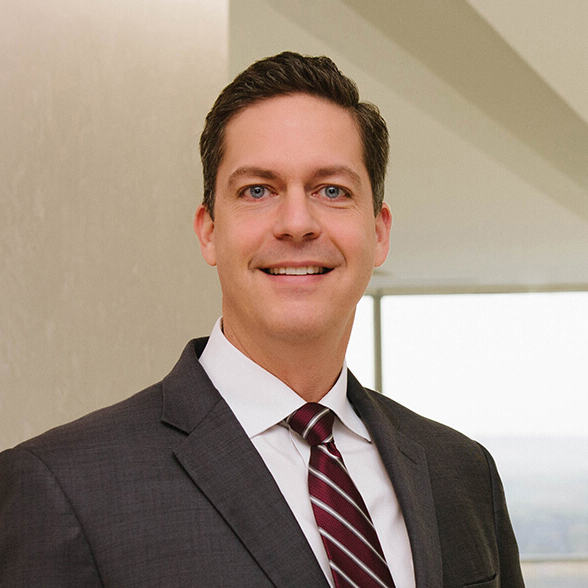 Earlier in his career, Jeff served for sixteen years as a member of the Fort Thomas Planning Commission, taught numerous courses at Chase College of Law as an adjunct professor for twelve years, and chaired the Banking, Commercial & Bankruptcy Committee for the Ohio State Bar Association. Jeff and his wife, Carolyn, and three children live in Northern Kentucky. Jeff enjoys spending time with his family and supporting the arts, often simultaneously. Jeff currently serves as vice president for The Carnegie and is a past president for the Kentucky Symphony Orchestra.